This new album features quiet arrangements of well-loved hymns that focus on the topics of prayer and worship. These cherished devotional songs are delicately explored through meditative, instrumental piano and warm string accompaniment. Gentle melodies and thoughtful settings invite the listener to prayer and contented thankfulness. Hymns included “Sweet Hour of Prayer,” “Be Still My Soul,” “Be Thou My Vision,” “Fairest Lord Jesus,” “For the Beauty of the Earth,” and many more. The piano arrangements with strings is absolutely beautiful. A great CD for a time of meditation, or just to calm the household or spirit. Couldn't go wrong to gift to anyone. 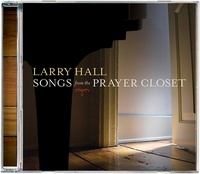 Listening to "Songs from the Prayer Closet" is very calming when stress from work or other situations gets to be too much. It reminds me that our God is truly caring for us. The music filled me with a sense of awe and fear standing before the holy God. But at the same time, I felt peace because I can approach this same holy God through the righteousness of Christ, which He obtained for me by paying my sin debt at the Cross. This CD is a must for focusing on our Lord anytime, hymns are beautifully arranged and soothing to the spirit...calms your thoughts into worshipful praise and thanksgiving to glorify the One we serve. Useful during prayer time. Also is perfect for background music while you study God's Word! Love it ...recommend it.